Sun Liquor’s two Capitol Hill bars are well known by the ladies of LUPEC for their neighborhood vibe and well-crafted cocktails. 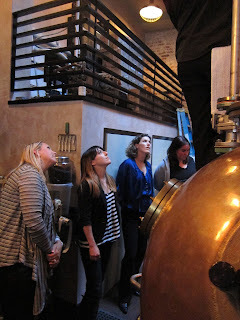 June’s meeting took us to the Sun Liquor and Distillery, located at 514 E Pine St., which opened in 2008. The moderately sized Pine St. location has an L-shaped bar, blonde wood booths and a large map of the world map mural covering one wall. If the interior reminds you of some place else, it's because owners Mark and Michael Klebeck also own Top Pot Doughnuts. There's a collection of vintage shakers behind the bar, Heywood-Wakefield-style booth design and large picture windows overlooking the street. At this LUPEC meeting, the ladies enjoyed cocktails featuring Sun’s house-distilled spirits: Hedge Trimmer gin, Unxld vodka and Gun Club gin. We were also treated to a tour of distillery, where Erik Chapman cranks out about 400 bottles of day. The bar is now able to sell bottles out of this location, which you can pick up for just $32 each. The Ford Cocktail--which I kept wanting to call the Tom Ford--was a crowd favorite among our booze-loving ladies. Served up, in a martini glass, the Ford was the type of spirits-forward drink most of us love. Missy said they’re lucky to have a quality neutral grain spirit at their disposal at Sun Liquor for making bitters in house, and their orange bitters added a nice depth of flavor to the Ford. After enjoying a round or two of drinks, ladies joined Erik in the distillery in small groups of 8 to 10. Erik explained the 11-hour process for creating Sun’s signature products in their 100-gallon copper still. They distill it 3 times to remove impurities, reducing it from 100 to about 45 gallons, before adding about 30 gallons of water. The Gun Club gin is currently Sun’s most popular product. This so-called “naval strength” style gin is so named because gunpowder can still ignite it. I don’t recall the exact ABV, but most naval strength gins are upwards of 50%. Both the Gun Club gin and Sun’s London Dry style gin--Hedge Trimmer--are distilled from organic Washington wheat and include a variety of herbs: juniper, coriander, angelica root, cassia, ginseng, birch, fresh orange and lemon, and sassafras. While Chapman wouldn’t divulge which herbs were used exactly in each gin, he did say that sassafras plays a large role in the Gun Club, and that he uses twice as much citrus as most other distillers. In addition to the big still, Chapman also runs test batches on a smaller 25-gallon still. They’ve been experimenting with brandies, as well as an aged gin that is currently stored in barrels aging at a facility in Eastern Washington. Hopefully LUPEC ladies will be sampling that very soon. Thanks Erik, Missy & Derek. 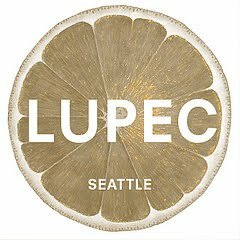 Cheers to you from LUPEC!